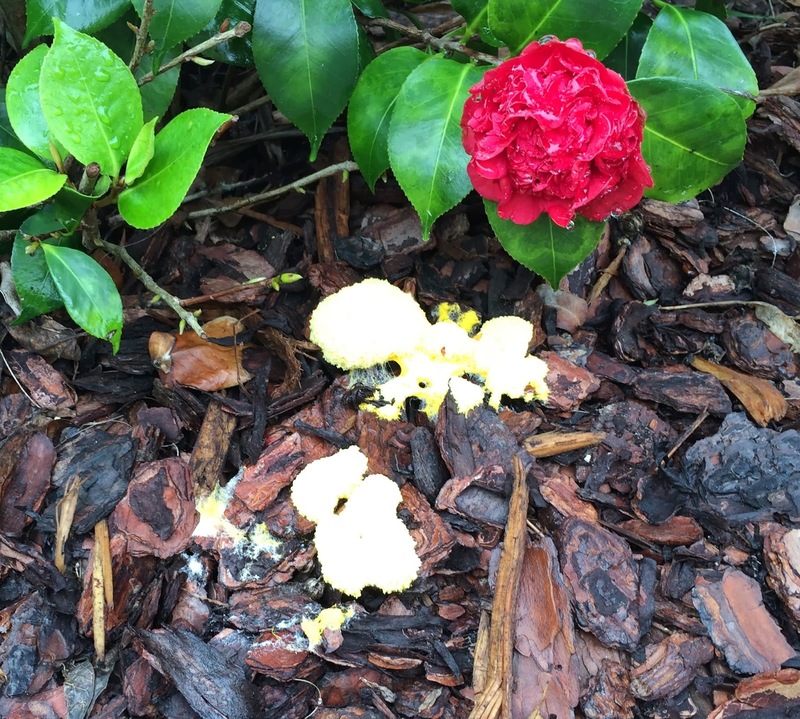 The photo at left was taken by My Lovely Bride - deposits of an unusual yellow substance in our front flower bed. Her first thought was that maybe a coyote with a digestive problem had visited our yard and disgorged his stomach contents. An even grosser thought was that it was from a big snake. After some sleuthing, we found that the yellow stuff was actually Fuligo septica, yellow slime mold, also called "dog vomit fungus: (I am not making this up!). It often appears overnight, growing in pine bark mulch after a heavy rain. It is indeed gross, but totally harmless (assuming you aren't a vegan who thinks it might be a yummy snack). 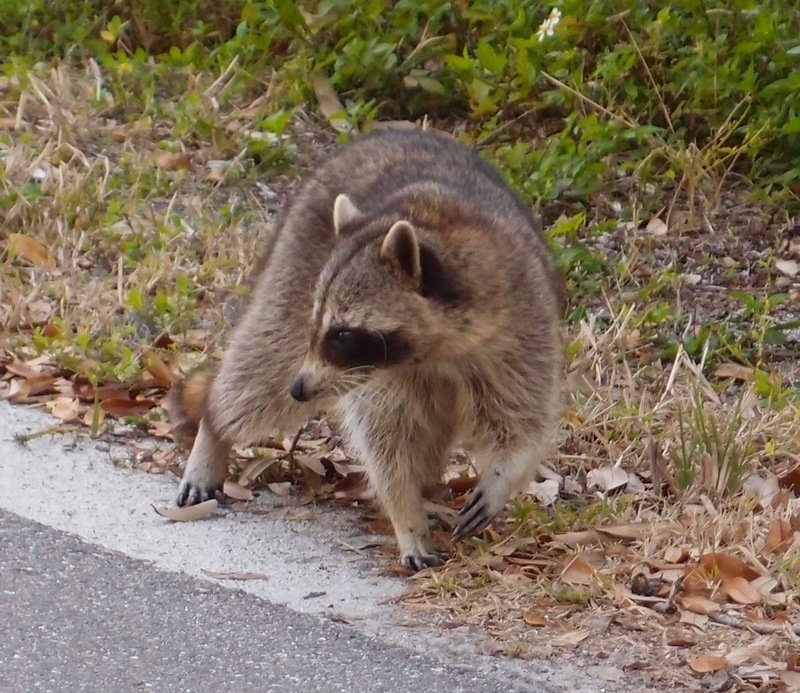 This next vignette actually occurred back in the Fort DeSoto campground, but I had forgotten about it until today. I was walking Rudy and Gretchen when I saw a cardinal landing on our car. He would alight on the car door, look at his image in the side mirror, flutter his wings and "strut his stuff", then fly away, only to return in a minute or two and repeat the process. 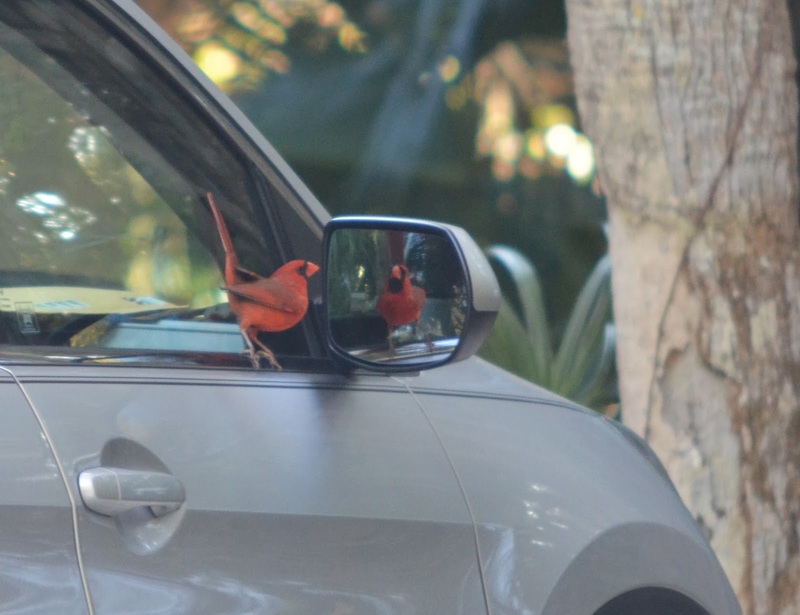 He seemed not only fascinated with his reflection, but amazed that the bird in the mirror was performing the same display (perhaps a mating ritual?) that he was performing. After recovering from an arduous day organizing the junk drawer, I took Suzanne out to the Santos bike trails to burn off some of her excess energy. Most of the ride was through quiet forest, with hardly another rider to be seen. But near the end we found a recent addition to the trail, a wood "roller coaster". Here is Corvette Chick practicing her technique and looking cool. "Staying Centered" has a different meaning when you're mountain biking. Finally, our good friends Bob and Jessica invited us to meet them for dinner at a local Greek restaurant (coincidentally, where a famous award-winning belly dancer would be performing). Suzanne thought it would be nice to see them again and have a nice Greek meal. I thought it would be nice to (a) see them again and (b) to watch a lovely, lithe belly dancer perform. (I avoided a Smack! this time by not telling My Lovely Bride about part (b).) When Jennifer the belly dancer asked for a volunteer, Bob practically knocked me down jumping up to be her partner for the dance. I'm not sure if Jennifer's look has to do with Bob's (apparent lack of) belly dancing technique or something he said to her... her technique, on the other hand... Wow! On Friday, our neighbors Jan and Bob Blythe (AKA My Good Friend Bob) loaded up their American Eagle coach and drove up north with us for some dog racing. Now, please, for those of you who are members of PETA or Gamblers Anonymous, please don't send me hate mail or picket my house. We did not go to a greyhound track. We did not win or lose any money. 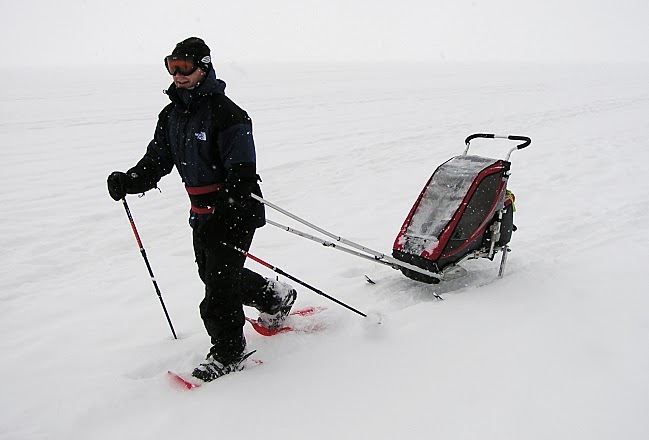 And we helped the economy of a town up north get through this brutal winter we've been having. So where did we go? Okay, so "up north" is a relative term... we went to Lake City, Florida, about a two and a half hour drive up almost all the way north to the Georgia state line. And instead of betting on greyhounds, we took our little dachshunds Gretchen and Rudy to the Doxie Derby. Here's the background... Doxie Derbies are held around the country, and provide an opportunity for these speedy, low-slung badger hunters to show off their blinding acceleration and unmatched focus in long distance races. Courses are generally all of 35 feet long. One owner kneels at the finish line, and the other kneels in the starting gate with their dachshund, awaiting the lifting of the plexiglass gate.When the gate lifts, pandemonium and chaos reign, with some dogs heading straight for their master/mistress, and others circling, wandering, sniffing, peeing, barking, or perhaps even simply sitting down to await a treat, a toy or a belly rub. With his weak right back leg, Rudy was not a contender in the races; he would, however, compete in the Smooching Pooches Contest, along with Gretchen. He would also act as a race adviser, providing canine-specific advice and moral support for his little sister. Suzanne (AKA Dog Mom) had been giving Gretchen motivational talks and supervising training sessions for months. Bob and Jan would observe the other contestants, give race by race critiques and tactical advice, and supervise still and video photography. Your Faithful Correspondent (AKA Dog Dad) would be the starting gate handler, cheerleader and "Relief Supervisor and Pooper Picker-Upper". 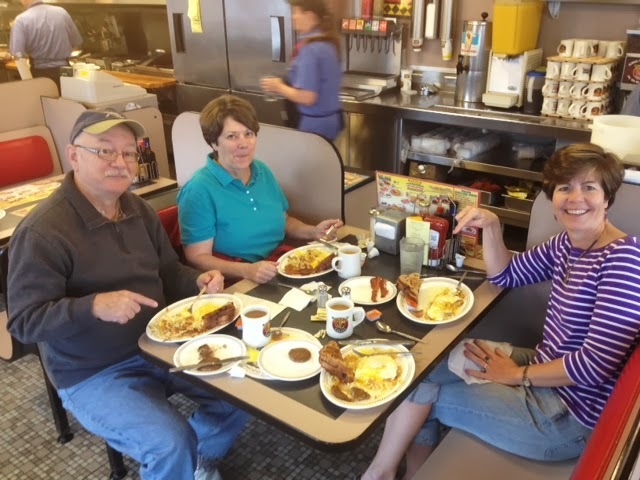 Gretchen and Rudy carbo-loaded on Race Day in the coach, while the Pit Crew enjoyed a traditional race day breakfast at Waffle House on the way to the Columbia County Fair Grounds. These events can be grueling, and we wanted to make sure we were fueled and ready for the arduous day ahead. We arrived early to scope out the competition, signed in and browsed around. The Derby was being held as a fund-raiser for the local Dachshund Rescue, and there were several doggies looking forward to adoption. These two already had homes, and were competing in the Best Dressed category. 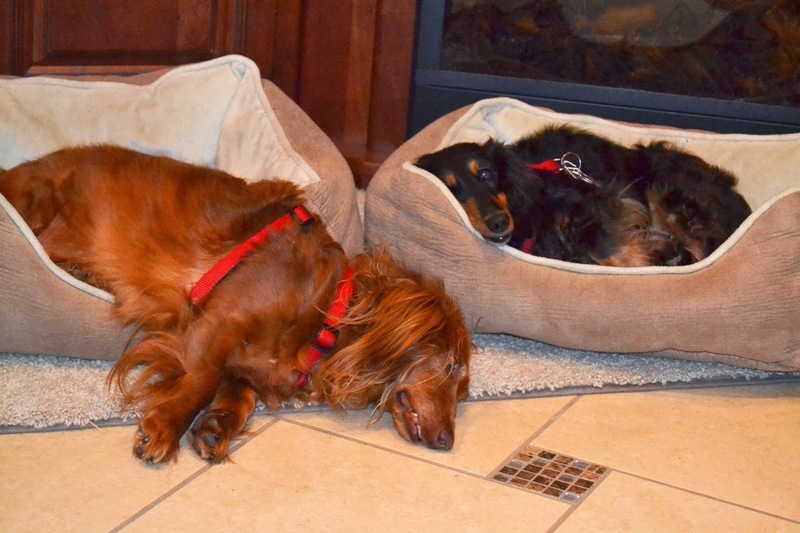 The English Cream color seen here at left is rare in the US; we've only seen a handful - most Dachshunds are red or black and tan, although our Gretchen is a black and cream; Rudy is red, but almost the color of an Irish setter. While this was billed as a Dachshund Derby, there were several mixed breeds competing, including this little guy who didn't look much like a Doxie, but who may have had a Wiener dog in his blood line back a hundred years or so ago. We nicknamed him The Infiltrator. There were lots of families there with their pooches, and this little girl got a special face painting to celebrate the event. Click here to see a great video of one of Gretchen's races, sure to make you smile. The "Show Stealer" was Skippy, an older Doxie whose back legs were paralyzed. He uses his front legs to pull a tiny aluminum cart and actually competed in and won a race and the look alike contest. The first photo shows his regular cart, and the second with his Skippy's Wiener Dogs attachment.Skippy has a lot of heart! Here you see a competitor giving Skippy a traditional dachshund greeting. By the end of the day, everyone was very tired. Our two Blotto Dogs are seen here in a maximum state of repose, otherwise known as "Dogatonic". 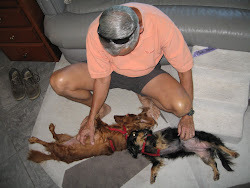 After a nap, the adults got ready to go out for dinner, allowing the puppies to rest in the coach. After locking the coach and getting into the car, Suzanne realized that she had forgotten something, and went back inside to get it. Here are Gretchen and Rudy with their award ribbons. We are very proud of our little Wiener dogs! 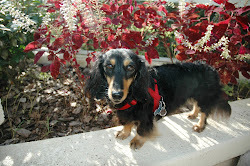 And special thanks to Bob and Jan for the great Doxie Derby photography you see here! St. Petersburg, Florida, is one of our favorite destinations. 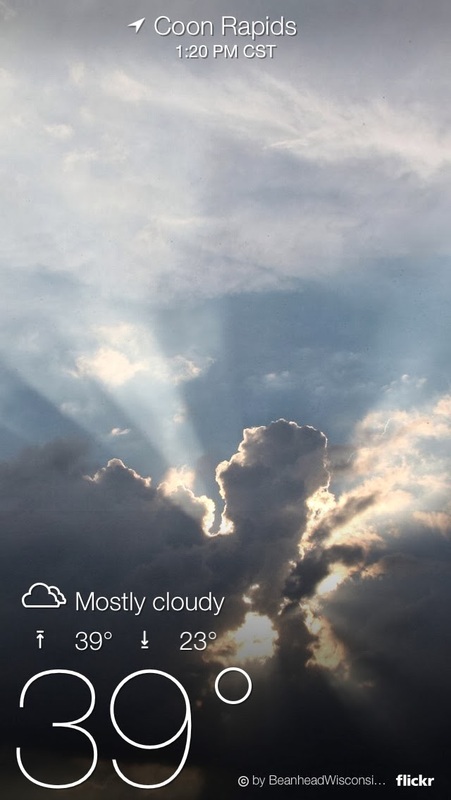 (It is far warmer and sunnier than St. Petersburg, Russia, or St. Peter, Minnesota). 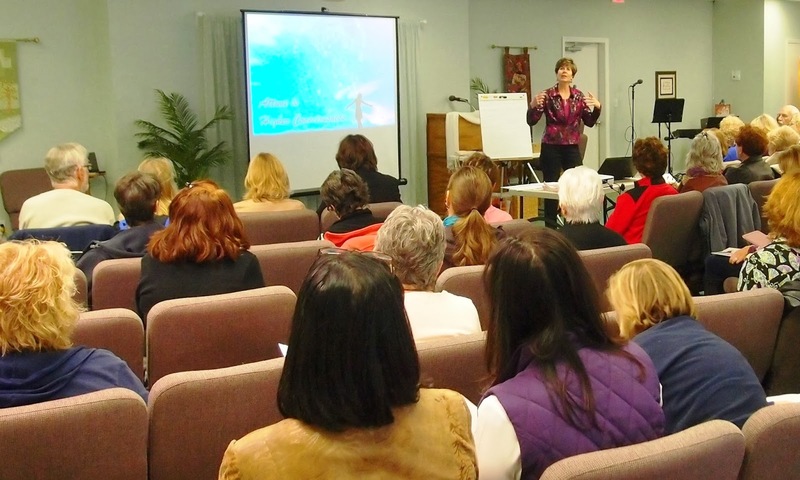 We were in St. Pete for another visit to one of our favorite venues, First Unity Church, where Suzanne had a session with Sanaya for a large group in the church sanctuary. It went very well, except for an unprecedented problem with the church's audio system; it was probably Sanaya's super-high energy that caused two different lavaliere microphones to malfunction and emit high-pitched squeals. Suzanne had to call a time out, but Unity's helpful staff rigged an old-style microphone on a boom that wasn't as sensitive, and she was able to continue. It was the longest Sanaya session she has done, almost an hour long. She was totally drained when the evening ended, but very happy. 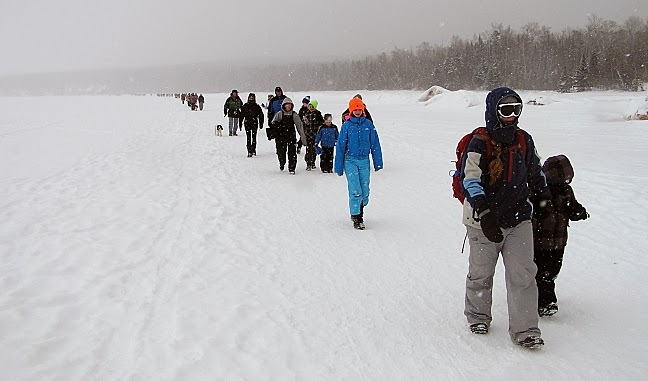 Here's another interesting beach scene... chosen particularly for readers from Wisconsin and other Frozen Tundra States... this of a Cheesehead on Snowshoes at the Apostle Islands National seashore. Now, where would you rather be spending a winter's day, in the photo above with My Lovely Bride on a Gulf of Mexico beach, or viewing the ice caves with the guy pulling the trailer with his kid trying to avoid frostbite???? While walking Rudy and Gretchen in our campground, we stopped and talked to a friendly couple from Jamestown, Rhode Island, one of our favorite anchorages when we were sailing. It turned out that we had a lot in common; Bruce and Dorsey are camping here in a cozy Airstream Bambi, but are avid kayakers, cyclists and sailors, with a beautiful Sabre 385 sailboat put up for the winter back in snowy/frozen Rhode Island. In fact, Dorsey had crossed the Atlantic on a steel Colvin Gazelle with her parents, and we had owned an almost identical Gazelle about 15 years ago. We had several mutual friends back in Newport, America's sailing capital (although Annapolis might debate that honor). We were able to entice them over later for sundowners (that's what sailors call cocktails, to confuse landlubbers) and swapped many more sea and land stories; we look forward to catching up with them again when we visit Newport in 2015. Okay, boys and girls, here is a special pop quiz. 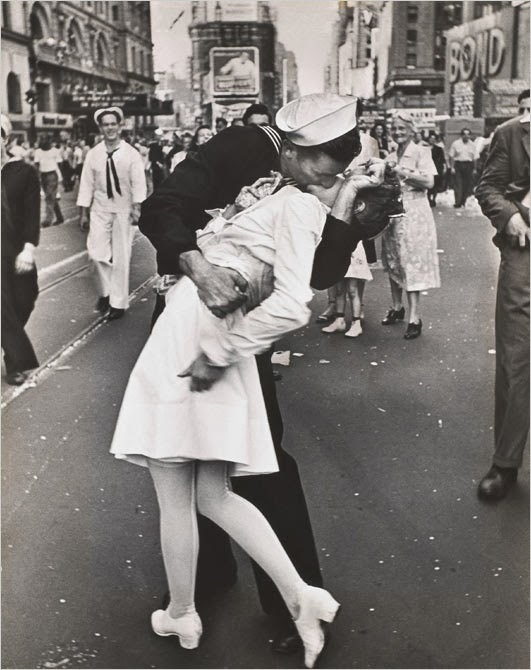 What is the subject of this photo? The first correct answer wins breakfast with My Lovely Bride and Your Faithful Correspondent at Panera or some other appropriate venue, depending on your location. If you are answering from Greenland, raw walrus will not be on the menu. Galley Slave; Lobstah! Saturday; Caravaggio; Ponte Vecchio; A Local Waterfall; On to Tuscany! My Lovely Bride outdid herself Friday night. Instead of taking me out to a Valentine's Day dinner, she decided to prepare a romantic gourmet repast at home. Here she is slaving away at the oven.The smells were driving me crazy, as she forbade me from looking into the kitchen while she was working, and I was unable to identify many of the unusual aromas. Caravaggio was almost forgotten after his death, and it was only in the 20th Century that his influence on painters who followed him was fully appreciated. 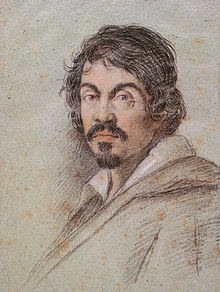 He was well-known for his use of chiaroscuro, the dramatic use of light and dark contrasts, with little mid-tones. 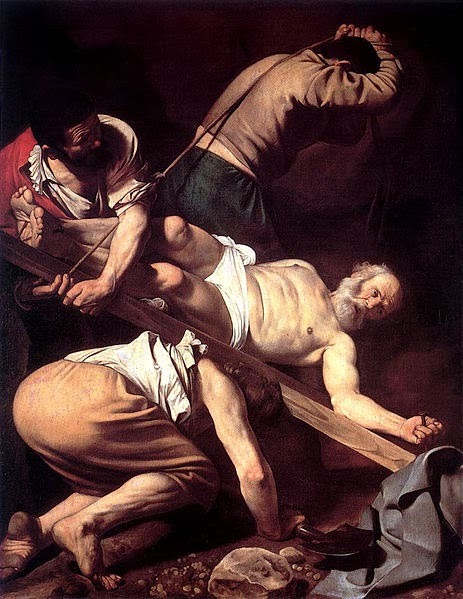 That technique can be seen in his famous painting, The Crucifixion of St. Peter. I've been racking my brain to find a suitable segue from 1610 Italy to 2014 Florida... let's see, okay, here's one: the first photo is of Rudy the Sailing Wiener Dog standing on the Ponte Vecchio in Florence when we were sailing the Mediterranean aboard our sailboat Liberty a few years ago. Rudy was literally a young pup then, less than a year old. Sticking to the Italian theme, we enjoyed al fresco munchies with our good friends Jessica and Bob at their walled villa here in The Villages. Both have Air Force backgrounds, but even with that disability, they are still friends - Bob's a laid back colonel who built his own airplane, and you don't mess with Jessica, a former firearms instructor who now teaches yoga. Jessica has decorated the aforementioned walls with colorful murals reminiscent of Tuscany. While enjoying a gourmet meal of stuffed salmon, crispy potatoes and grilled asparagus, we learned that they had recently attended a marketing presentation by Vermont Bike Tours and won the grand prize drawing, a bike tour in TUSCANY! Lucky guys... all I ever win in drawings is a fuchsia ball cap or a bag of compost... sigh. Long-time readers of this blog may remember the incident in 2012 which "spawned" the blog banner photo at top right of Your Faithful Correspondent staring down a piranha in a Rochester, NY, sushi bar. 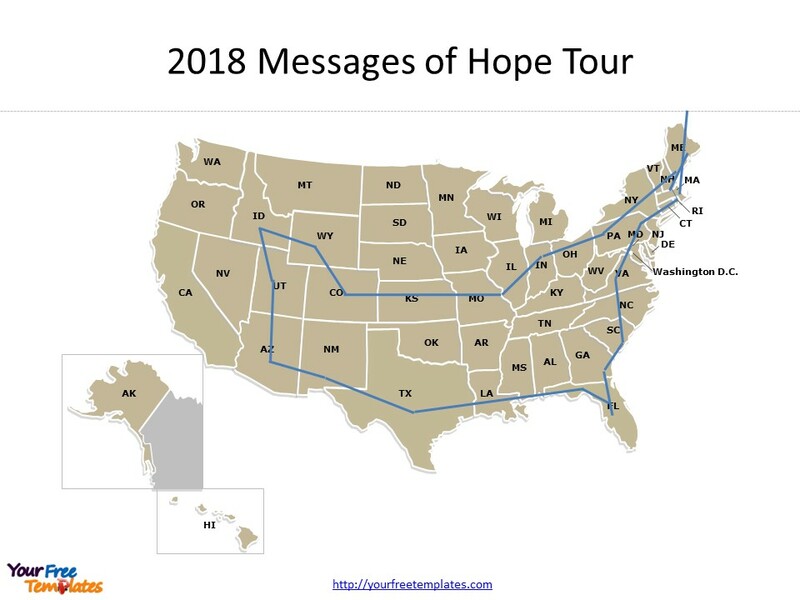 For background, it was the week of the debut of the Messages of Hope documentary in producer/director Chris Lavelle's home town, and Suzanne had eight events in seven days, a heavy schedule even for my young bride. She woke up on the sixth day totally depleted and asked me to help her by raising her prana. 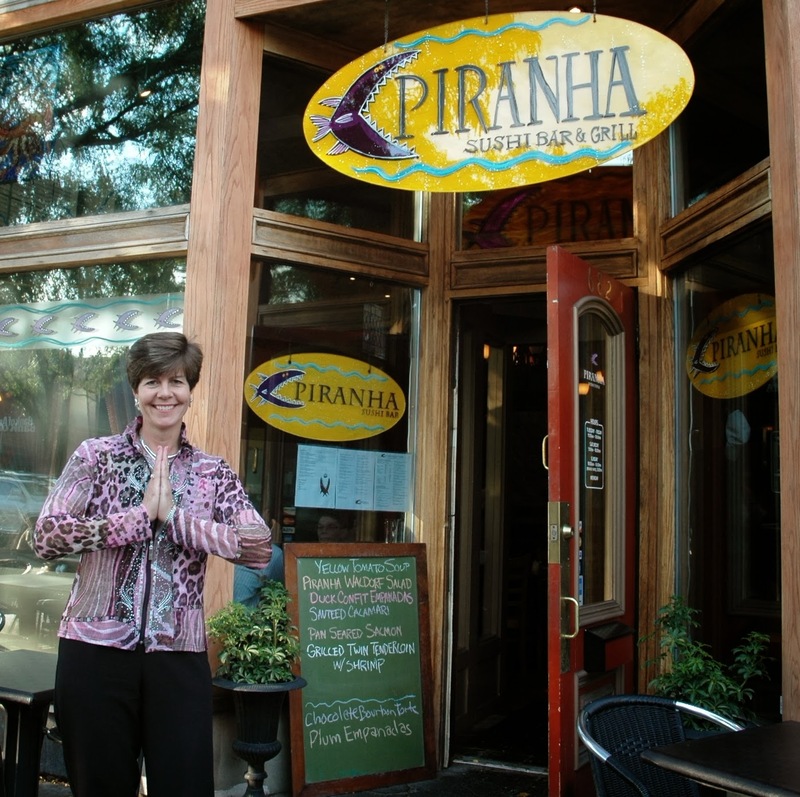 I responded with a profound spiritual observation: "I thought prana was a man-eating fish from South America." After debating whether to keep me for yet another trying week, she told me how to hold my hands above her head and channel healing energy. I was amazed when my hands got very warm and she felt invigorated. Then it was time to grab a quick bite of dinner before our next event. As we were driving into Rochester, Suzanne said "How about sushi? I'll look up a candidate restaurant on our iPad." A moment later she gasped and broke out laughing; the closest place was the Piranha Sushi Bar. We arrived, had a great meal, and chatted with the sushi chef, a very friendly Hispanic guy with a shaved head and tattooed skull. But what was really unusual was the Yogananda picture behind the bar. It turns out the owner was into the metaphysical. Suzanne presented copies of Messages of Hope to the owner and the chef. The chef was going to read the book to his kids, and the owner apologized that he didn't have time to read any books, but would give it to someone who needed it. Two days later, a woman with a terminally ill son came in for dinner, sat at the sushi bar instead of her usual table, and learned about Messages of Hope. Mary Ann would find both solace and inspiration in Suzanne's story about her spiritual transformation after we lost our Susan. She ordered copies for everyone at her son Chris's memorial service, and would later attend Suzanne's conference in Crete and get a personal reading. On Thursday, Mary Ann and her sailing friend Ned joined us for dinner here in The Villages. It was like Old Home Week when we laughed about travel and restaurant experiences in Greece, and Ned and I chatted about his home town of Newport, Rhode Island, where he is a retired fire chief, and where I had been stationed for Navy schools on five separate occasions as well as a shipboard assignment. 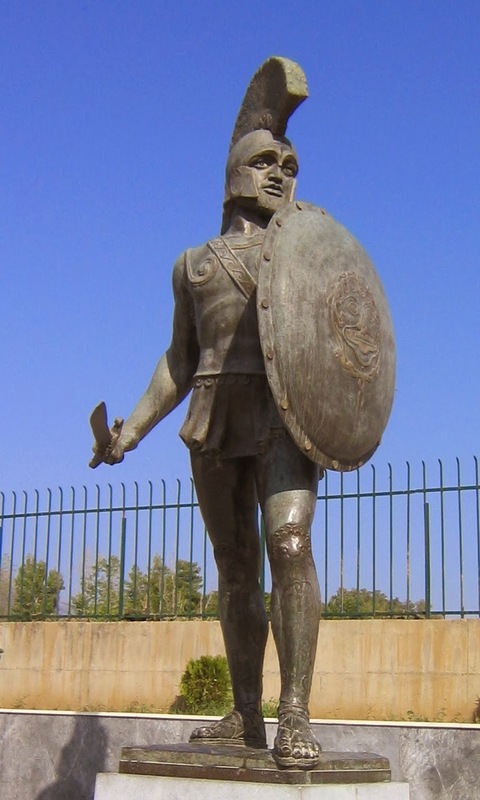 But what made the occasion particularly poignant was that in a reading earlier in the day for someone in South Carolina who had lost his son, a reference from the other side to "a round shield, like a Spartan warrior would carry" came up. Suzanne's client was baffled. While Ned and I and Mary Ann and Suzanne were chatting on the couch a couple of hours later, Suzanne quite unexpectedly sensed the presence of Mary Ann's son Chris. Suzanne saw him pointing at his tattoos. Mary Ann replied, "Yes, he had a big tattoo on his shoulder - a Spartan shield." Evidently Chris had piggy-backed on someone else's reading, knowing that his mom would be talking to Suzanne that very day. Other evidence from Chris followed, and Mary Ann's visit became even more meaningful than any of us had expected. Of course, we all know that it's St. Valentine's Day. 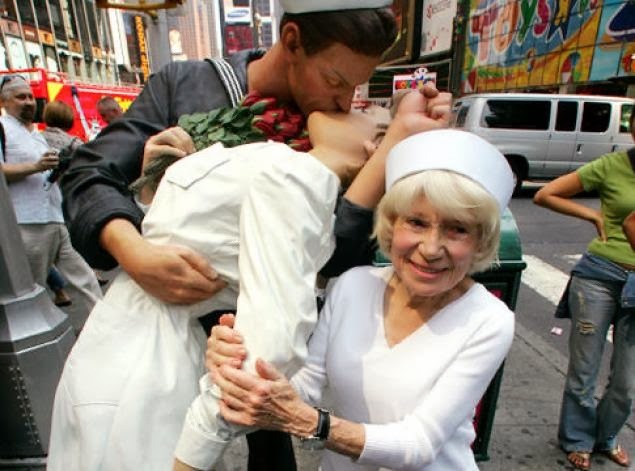 I decided to follow my mother's advice to her then teen-aged son: "Ty, it's just as important to keep your girlfriend's mother happy as it is your girlfriend herself." It was good advice then, and even better today. So since Suzanne's Lovely Mom Ruthie lives only three miles away, I thought I'd be chivalrous and get both wifey and Mother-in-Law roses for this special occasion. 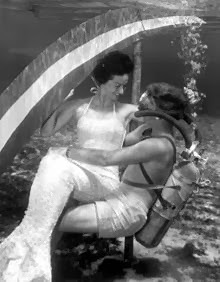 Since Ruthie was out card-sharking all day, we caught her at home in the evening. I think she was surprised and happy; I also know my supply of cakes, pies and pork & sauerkraut is good for another year! Okay, this question is designed primarily for English teachers and literary trivia buffs: what does Chaucer have to do with today's holiday? (If you are a UCLA English major, you might have no earthly idea, since Chaucer has been removed as a required topic for English majors in this new age of political correctness gone amuck, replaced by courses obsessed with victimhood. But I digress...) The answer is that Chaucer may have unknowingly "invented" St. Valentine's Day. 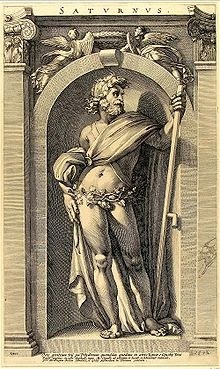 There is no apparent historical record of the holiday prior to Chaucer's poem "Parliament of Foules", published around 1375. His poem refers to February 14th (Seynt Valentyne's Day) as a day when birds (and humans) come together to find mates. 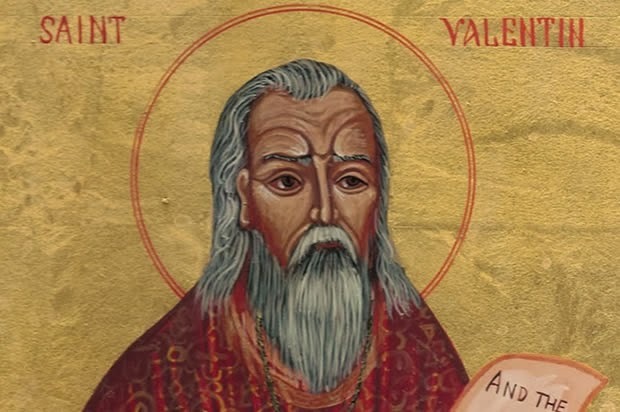 It is believed that the original St. Valentine was a priest beheaded by Roman Emperor Claudius II in a temple outside Rome for helping then proscribed Christian couples marry. Finally, Suzanne received the following notes from her good friend and retired US Army Colonel Charles Cunis in Colorado. She had sent him a draft of the chapter in her new book that features him. He replied, "Am serving as 'Trailing Spouse' supporting picking out window treatments for new home. Priority of fires to this mission. Will download your messages upon arrival home station." Later, he updated Suzanne with: "As I reported from the confines of the Pottery Barn, full support as the 'Trailing Spouse' has paid off with a successful mission. Served as an alleged 'consultant' when a selection was made. Stayed seated in a chair and arose only when called upon by my Dear Elaine. Things work better that way." Yes, Charles, many of us former military husbands understand your difficult assignment; Well Done, and excellent reporting! On Sunday, Suzanne and Christine Smith got together to make some beautiful music. 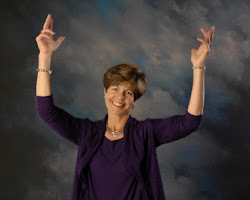 Christine is the director of The Villages Flute Choir, and a former university flute professor. In this session, Suzanne was playing the bass flute and Christine the piccolo.It was an unusual combination, the haunting melodies of the very large bass flute complimenting the high notes of the tiny piccolo. 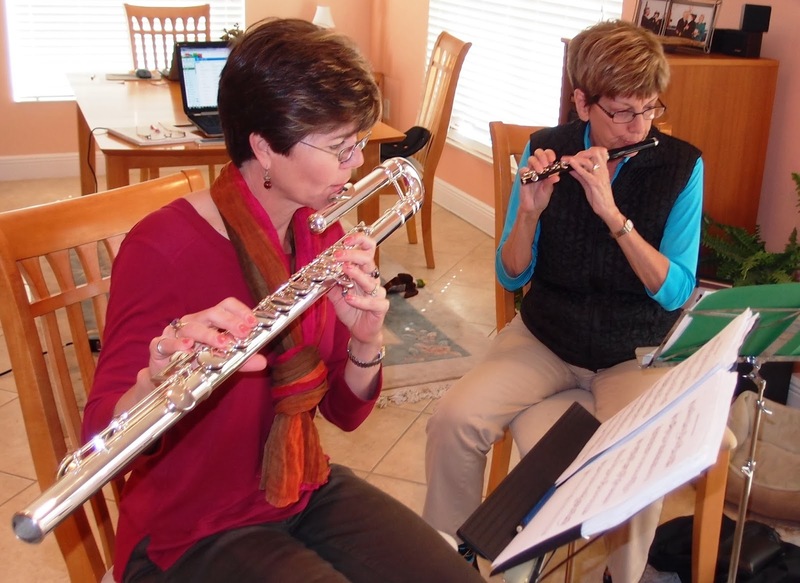 They plan to play a special duet at the flute choir's Spring concert in April. On Tuesday and Wednesday, we took a short vacation. Not to Paris (it's cold and wet there); not to Sochi (not only is Putin a bum, but Sochi is actually warmer than Orlando... and the IOC selected it for the Winter Olympics for why? ); not to Minot (but why not?). Instead, we drove our coach on a two day trip to Dunnellon for a ride on a Rainbow (you might think that this is beginning to sound like Ireland, but you'd be off by several thousand miles). Actually, Dunnellon (pop. 1,951) is all the way on the other side of Ocala, in scenic Marion County, Florida. Why, you may ask, did we pack up and go camping (okay, that may be a stretch, too) for just two days? 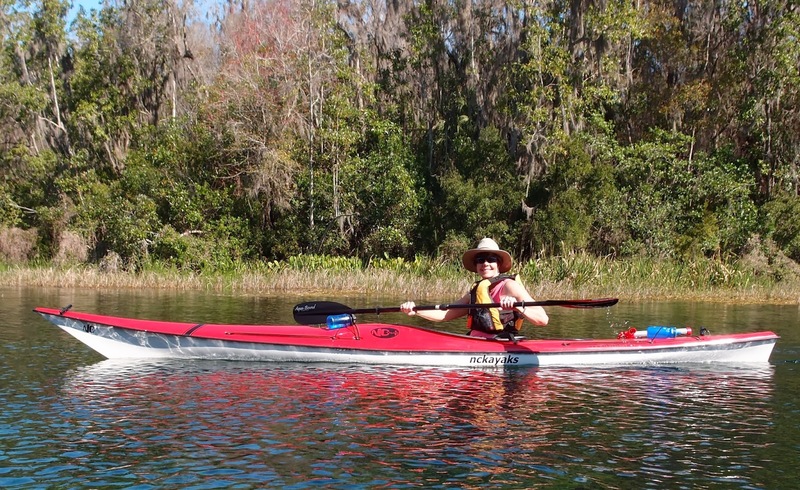 Well, first, we had never been to Dunnellon, second, a nice state park campground was located there; and third, we had never kayaked the Rainbow River. After setting up our camp at Rainbow Springs State Park, we drove down to the river and got our kayaks ready to launch. 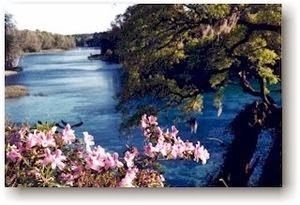 There was a couple already swimming in the river; Rainbow Springs (formerly known as Blue Spring) was only a mile or so upstream from our campground; it is a first magnitude spring, and the fourth largest spring (in volume) in Florida, pumping out 490 million gallons of water a day. Fortunately, I've had better luck with my mermaid. Here she is paddling her red (what other color would you expect from Corvette Chick?) kayak on an undeveloped stretch of the Rainbow River.Our fiberglass kayaks are fast and very stable, having a much lower center of gravity than a canoe, for example. The Rainbow is crystal clear; you can see the mixed sand and grass bottom clearly, and the water is between five and ten feet deep in this spot.You can make out many limestone rock formations on the bottom; the springs typically flow out of aquifers resident in the limestone substrata. There was a plethora of wildlife here on the river; turtles, a bald eagle, kingfishers, anhinga, great blue heron and white ibis were the most conspicuous. These four painted turtles (Chrysemas picta) are warming themselves in the 75 degree sunshine.When preparing to dig a hole for laying her eggs, the female of this species displays a unique behavior that is not completely understood; she presses her neck against the ground at several potential nest sites, perhaps sensing soil temperature, moisture, texture or smell. She may lay up to five clutches of eggs per year, but two is more common. This expert swimmer, an anhinga (Anhinga anhinga), is spreading his wings to dry its feathers. This is necessary because their uropygial glands do not produce enough oil to waterproof their feathers. This is actually an advantage, because it allows them to swim underwater very quickly to catch fish and frogs. They are also called snakebirds because being barely buoyant, they swim on the surface of the water with only their slender necks showing. These American white ibis (Eudocimus albus) were having a confab in this tree. 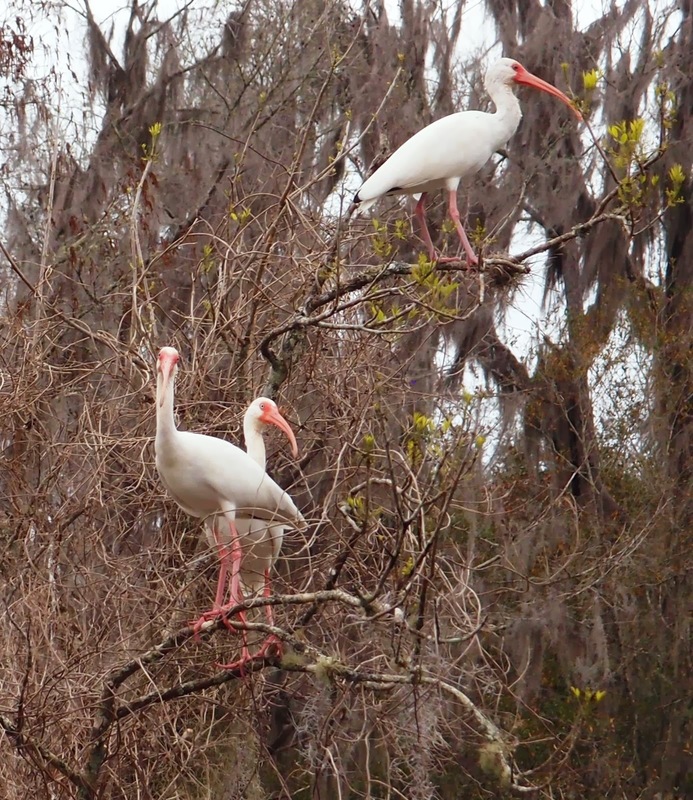 Ibis associate in huge colonies; the St. Johns River is also a favorite breeding location. During both mating and incubation periods, the males aggressively defend their nests and actually undergo a period of near starvation to insure the survival of the females and their eggs. Quite noble, I'd say! While on the Rainbow, we met a couple from northern Georgia in a tandem (two seat) kayak. They were very happy to be here in Florida and not near Springer Mountain north of Atlanta today. The coldest winter in memory, at least for most of the country, has been quite bearable here. We only expect low temperatures around 38-45F over the next few days, with highs from 55-71F. One of the most common species of wildlife encountered on the Rainbow River and other spring-fed streams was absent for both our paddling trips. Tuber obnoxious (male) is generally found here on weekends, usually in large affiliated groups making lots of noise and consuming large quantities of malt beverages. I was hoping to get some photos of the female of the species (Tuber toplessia) but was very disappointed by their absence; after all, the local college was in session. Darn! "Have you gotten your flu shot?" How often do we see that poster in doctors' offices? I thought about influenza when Suzanne told me about a client whose mother was the only survivor of her grandmother's six children; the others had died of bronchitis, but the root cause was probably influenza. 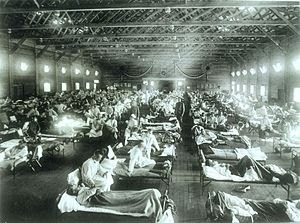 Fortunately, outbreaks of influenza in the late 20th and 21st Centuries have been relatively minor compared to the Great Influenza Pandemic of 1918-1920, which took over 50 million lives worldwide, the most devastating epidemic in history. By comparison, more people died in one year from influenza than died in the Black Death Bubonic Plague of 1347-1351 or in World War I, when 16 million lives were lost. This nurse at an emergency field hospital may have been one of the 700 recruited in October 1918 by the US Public Health Service to help the 1,000 doctors who signed up to fight the epidemic. 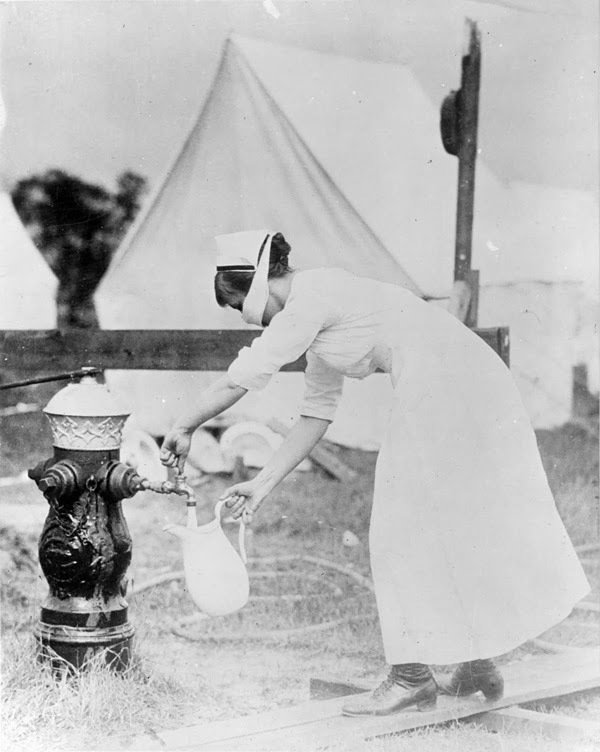 Fewer nurses than doctors were available because many nurses had already succumbed during the initial months of the pandemic, due to their closer proximity to and interaction with those afflicted with the disease. 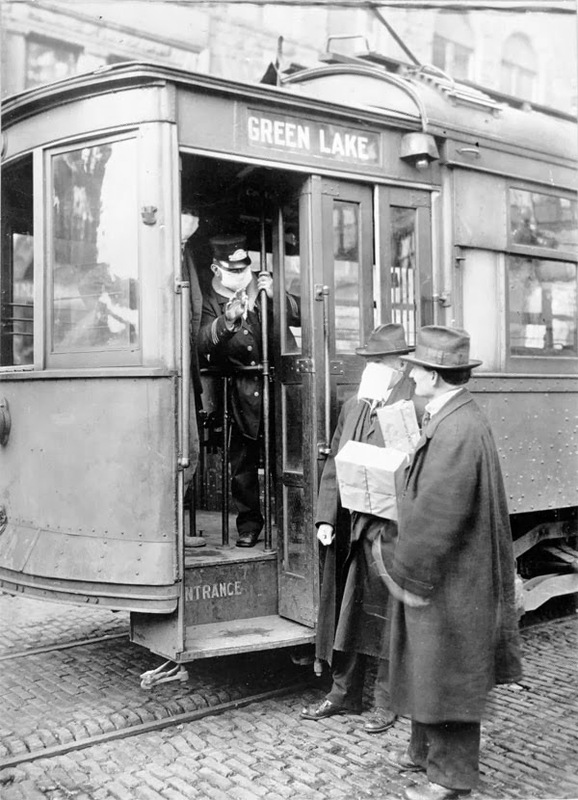 Trains, buses, trolleys and department stores were ideal locations for transmission of the disease, and great efforts were made to get people to wear protective masks. In this photo, a Seattle street car conductor is refusing to allow the gentleman without a gauze mask aboard his trolley. People were advised to wear masks at all times, even indoors. 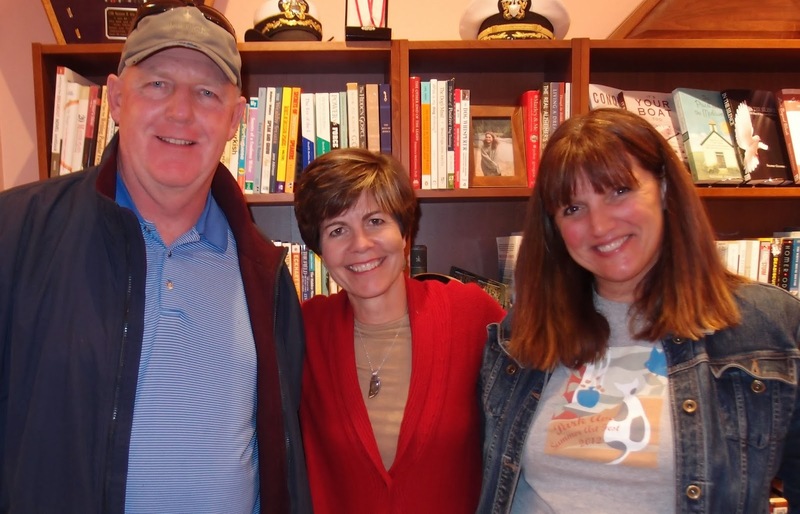 Recently we had the pleasure of getting together with some of Suzanne's extended family who were visiting. Here are Brent, Cheryl, Olive (the shy one), Matthew, Ruthie, Eleanor and My Lovely Bride, the last two apparently having found something hysterical to yuck about. Ruthie seems to be wondering what her mom and MLB found so funny. My back was still bothering me, so while Suzanne acted as tour guide for Eleanor, Olive, John, Beth and Chelsea on a canoe trip to Lake Griffin State Park, I walked Rudy and Gretchen and Matthew pushed Ruthie in her stroller around the park's short hiking trail. Our fearless canoeists found several alligators sunning themselves on the shore, and everyone seemed to enjoy the pleasant temperature and sunshine; what, isn't Whitefish, Montana, warm this time of year? Actually, we've had more than our fair share of wet, raw days here in The Villages recently, but this was one of the best days this winter. On Saturday Suzanne gave her SOAR! Workshop to over 50 enthusiastic attendees at Unity of The Villages. A hearty "Thank You!" 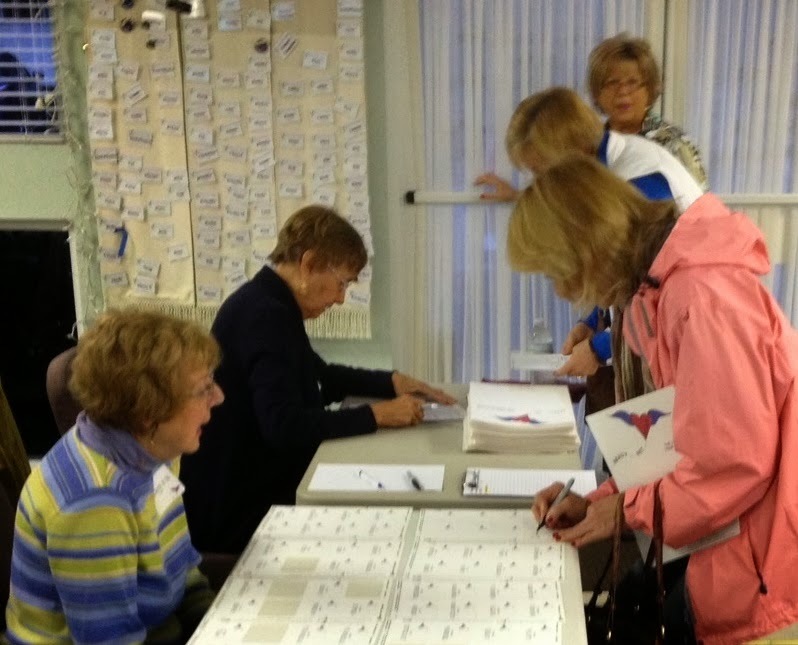 to Karen Leonard, Marilyn Dyer and Bev Garlipp for helping Suzanne with registration and book sales. Finally, for those of you who have called Suzanne "The Energizer Bunny", let me show you a candid shot of her after the SOAR! 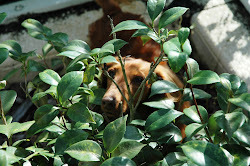 Workshop, a glass of Chardonnay and my Famous Chicken Marsala; I thought that only Dachshunds could look that relaxed!